Designing this purse was a fun exercise in creativity. I had a fabric that I wanted to showcase, focusing on it, but just making a purse out of it without some other design element was boring. 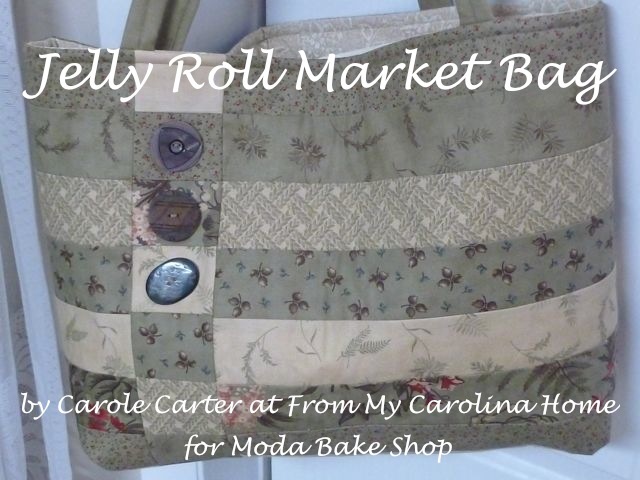 So, I took the basic idea of my Jelly Roll Market Bag, and did this one with the accent stripe on the left with three buttons. 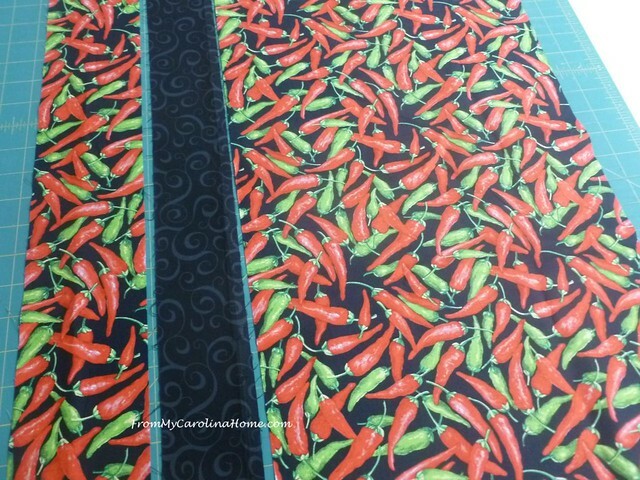 To begin, I cut a large piece of the chili pepper print 16-1/2 x 24 inches. Measure in from the left long side 3-inches, and cut a 3-inch strip from the fabric. Move the 3-inch strip to the left and insert a solid black strip 2-1/2-inches x 24-inches. Sew the strips together. 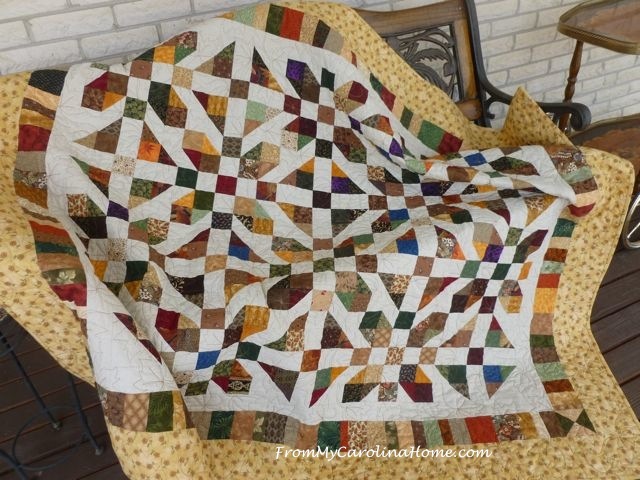 Quilt this piece with a solid color backing. 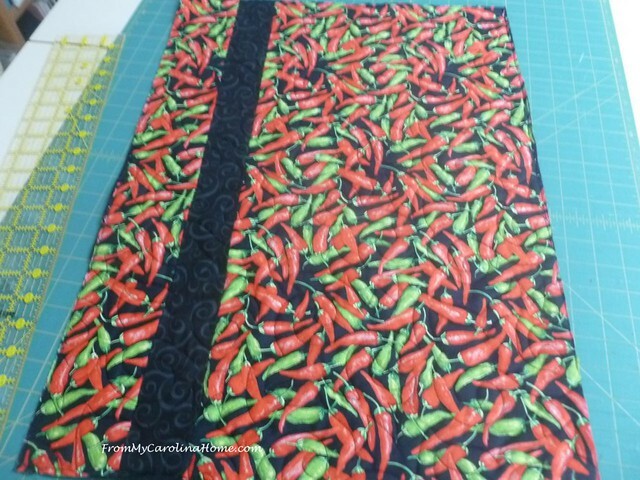 The backing fabric will become the lining of the bag. 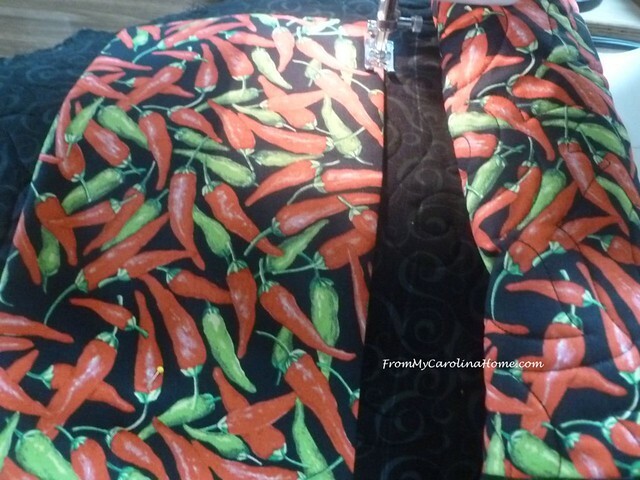 A solid or tone-on-tone print is good because it won’t compete with the focus fabric. I used a black tone on tone for both the backing and the accent strip since the background of the focus fabric was black. I wanted the quilting to be very subdued too, so I used black Aurifil thread in both the bobbin and top thread. 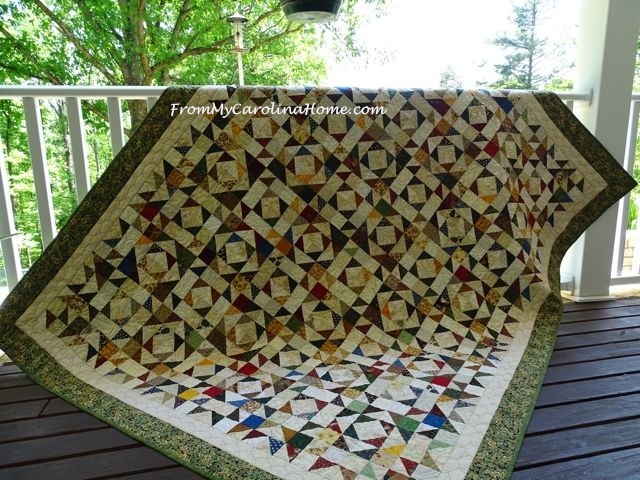 I quilted the piece on the longarm, but it is small enough to easily quilt on a domestic machine. The top half is quilted here and the bottom is yet to go so you can see the subtle difference. Trim to size, 18 x 24 inches. Make the straps by cutting a WOF strip x 3-inches. 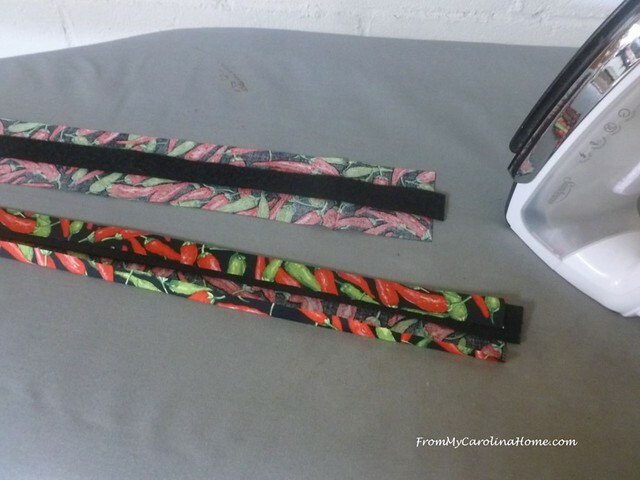 Cut the strip in half and trim the selvedges to make two strips 20 x 3 inches. Cut batting strips 1-inch x 20 inches. Press up one long edge of the handle strip about 1/4-inch. Lay the batting strip in the center of the handle. Fold the unpressed edge over the batting, then fold the pressed edge over the top. 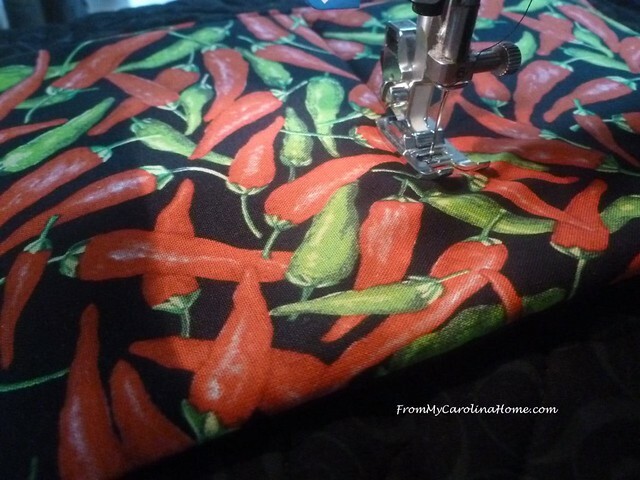 Sew two or three lines of stitching on the handles, with one stitching line close to the folded edge of the fabric to hold it closed. 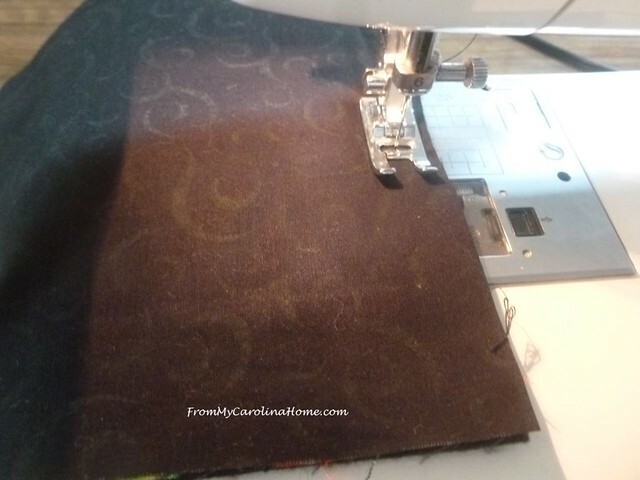 Measure in four inches from the edge along the 18-inch side and place the handle end right sides together on the purse base. Do the same for the other end of the handle on the other edge of the purse. Pin and stitch. Repeat for the second handle on the opposite end of the base. A nice size inside pocket is a must to corral small items like keys or lipstick. 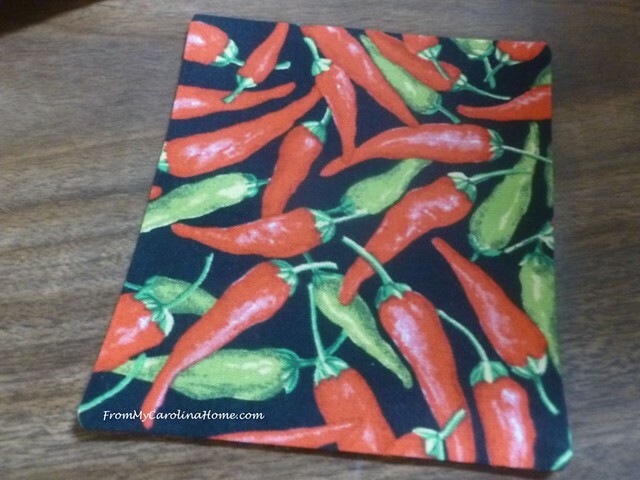 To make the inside pocket, cut a piece of focus fabric, a lining fabric and a batting scrap 6-1/2-inches x 12-1/2-inches. 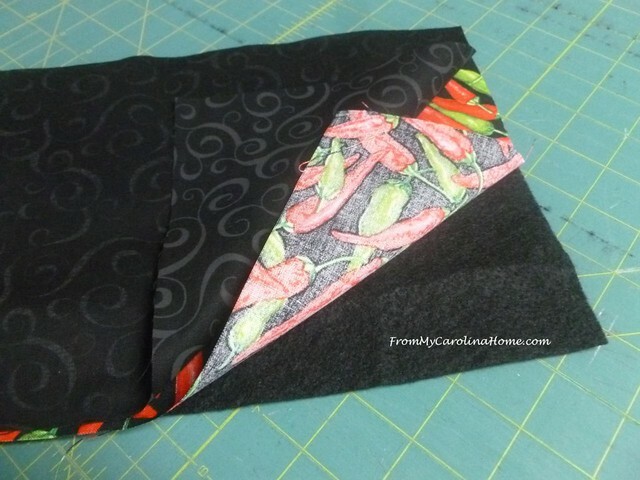 Layer your focus fabric right sides together with the backing fabric, adding the layer of batting on the bottom. Sew around the edge, leaving an opening for turning on the short side. Clip corners, turn and press. Place the pocket four inches from the top edge of the inside side, making sure it is on the back side of the bag, centered from left to right. The back side will have the accent strip on the right when the bag is folded up. Topstitch in place down one side, across the bottom and up the other side. 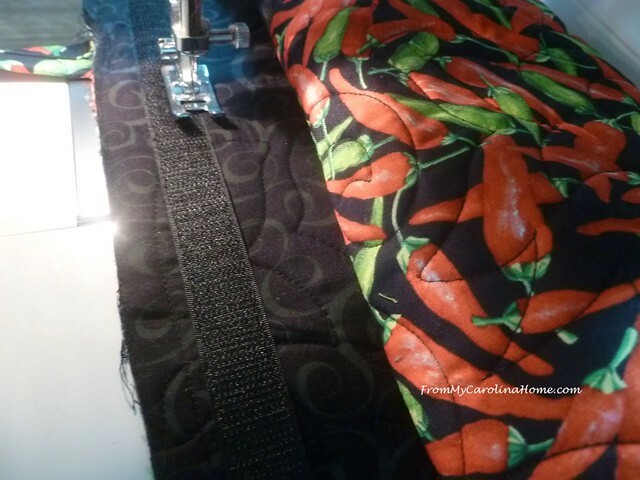 I use black thread here too, which won’t be obvious on the front of the bag since I quilted it in black too. Run one line of stitching through the center of the pocket unit from bottom to top to divide it into two sections. Velcro is used for the closure as it is fast and easy. 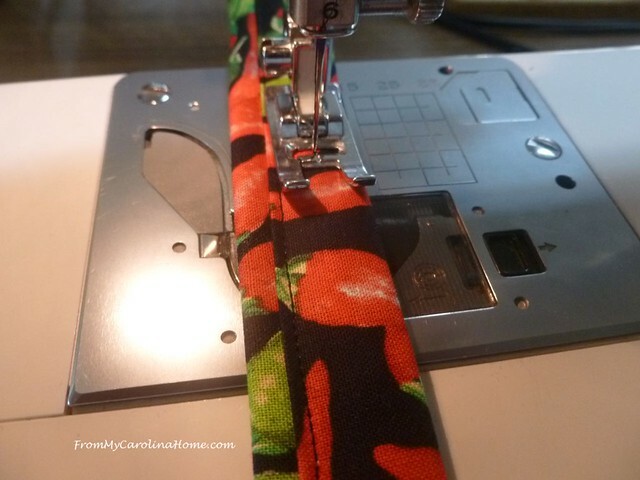 Use a 15-inch strip of velcro, sewing the edges down about 3/4-inch from the top of the bag. Sew all the way around the velcro. I put the softer side on the same side as the inside pocket so it doesn’t scratch my hand when reaching into the pocket. I also put a very small outside pocket on the bag for my cell phone. I need to find it fast if it rings, and not having to dig around for it is easier. I don’t have a smart phone, so the pocket is small. For your phone, measure the size, add one inch to both dimensions and make your pocket that size. 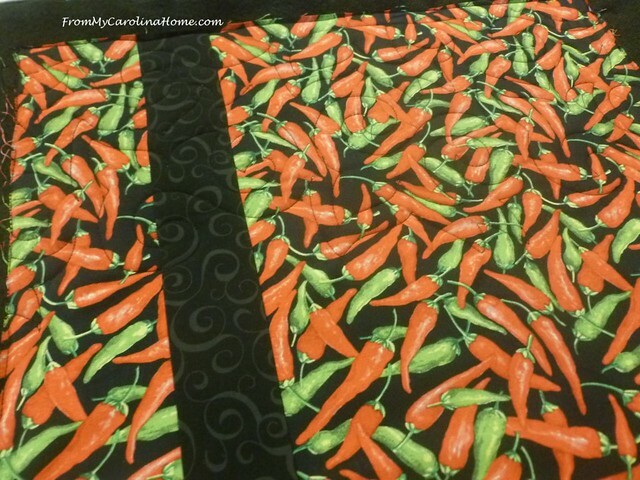 I used the focus fabric on both sides, and no batting. 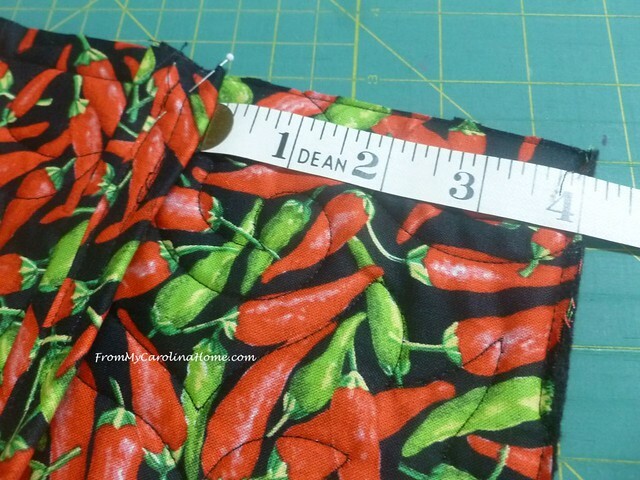 I made the pocket in the same way, placing right sides together, sew with 1/4-inch seam, clip corners, turn and press. Position the pocket on the front of the bag, about 3-4-inches from the top, and 3-4 inches from the right side. Eyeball it to be sure its proportions look right with the placement. Stitch down the sides and bottom. 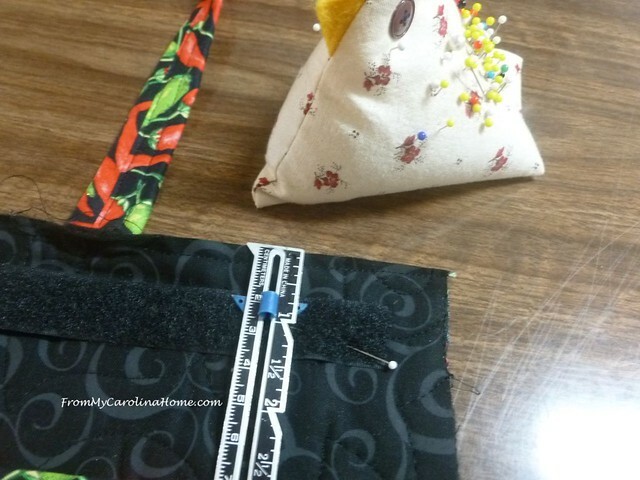 Click HERE for the next post Finishing the Focus Fabric Purse. 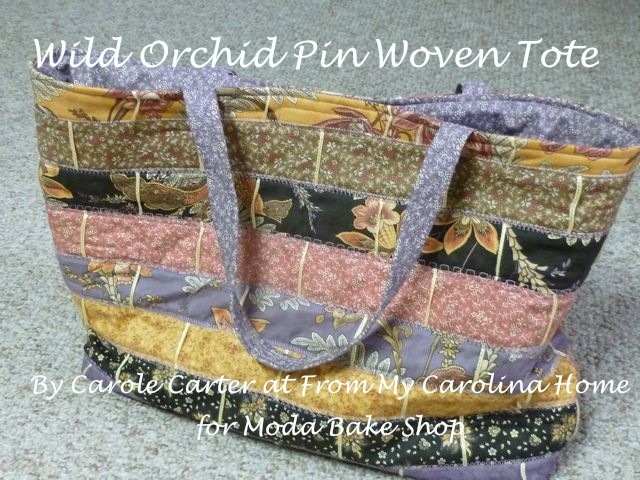 Do you like to make your own purses and bags? 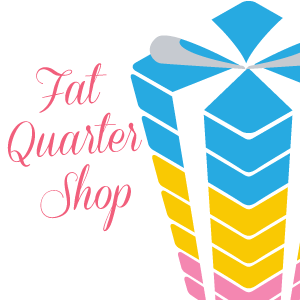 Great focus Fabrics On Sale Today at Fat Quarter Shop! Wouldn’t this be cute in a Christmas print? 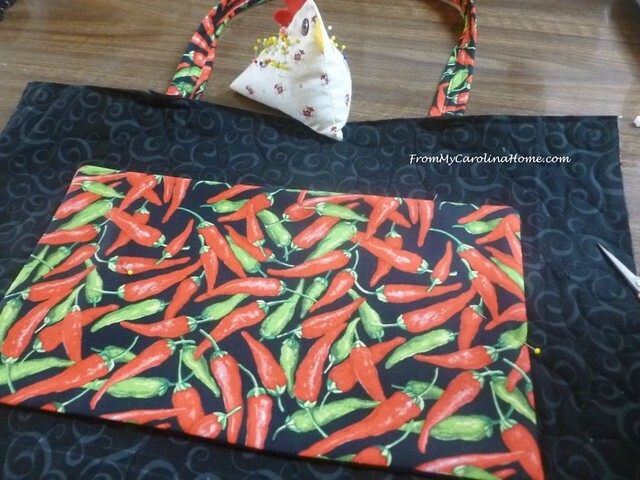 Check out my Charleston Bag pattern on Craftsy, another fun way to use up your jelly roll strips. On Sale 25% Off until 6/30/18, regularly $9, now just $6.75!! That is really cute. I like the addition of those fancy buttons. What a neat idea! Love the bag and the buttons are the perfect touch. 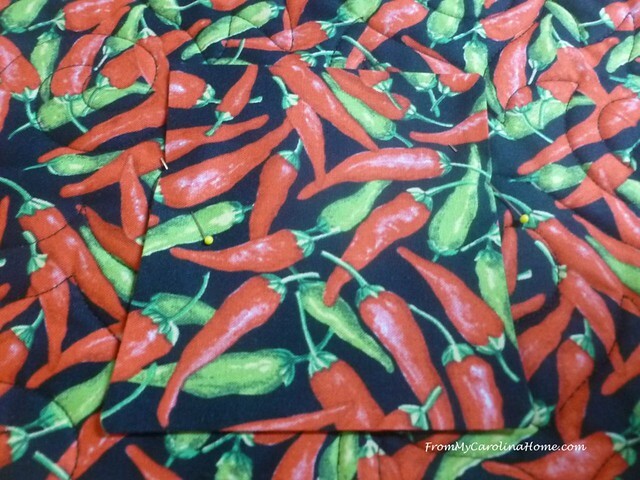 I’ll buy a fabric I think will make a great purse and then never get around to making it. I should unearth one of them and actually follow through. I don’t like to carry a big purse and I like to make the strap long enough to do a shoulder cross over. And I need to add another pocket for my phone since it always seems to fall to the bottom even in a small purse. 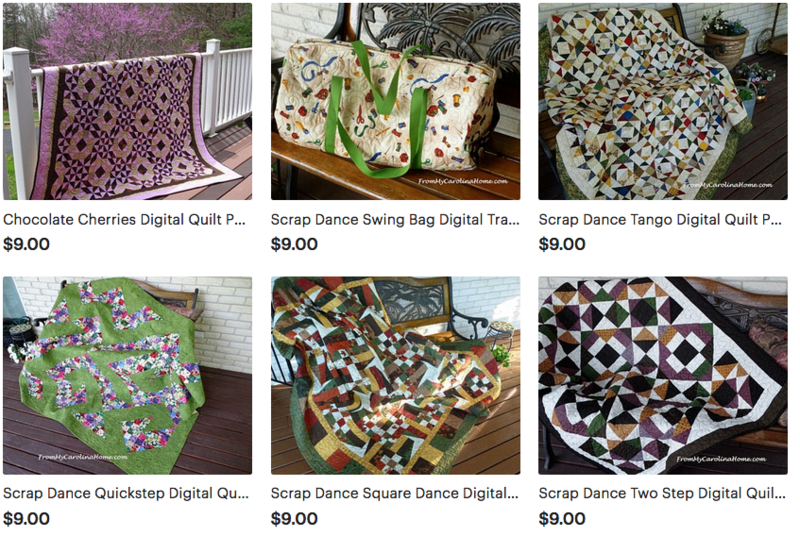 Hello Carole; I do enjoy creating purses and totes, especially for gifts. I am not much of a purse person. Yet, I have enjoyed making several of your tutorials. 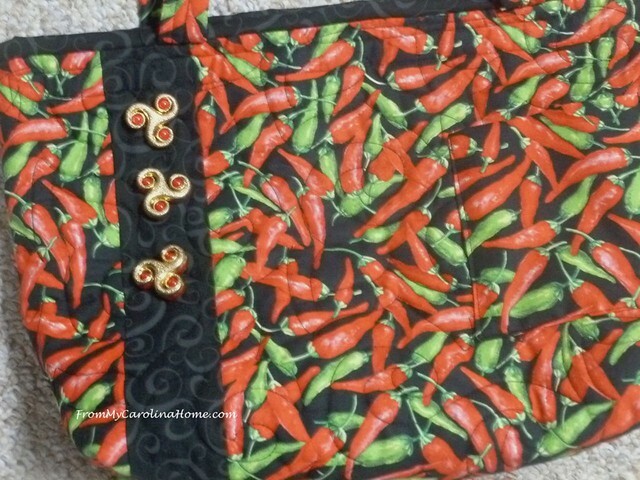 I have the same fabrics you used for this purse, I thought that was rather funny. I look forward to reading the remainder of this tutorial. Thank you for sharing and have a great day! I really like your accent strip and those great buttons. I don’t like making bags. I made one tote bag because my BFF made me do it, so I’m good forever. LOL I DO like seeing what you do with them, though! Thank you for the lovely tutorial of the purse, I think it looks like a fun purse. Glad I stopped at Val’s and visited your blog. Fantastic design, I’m loving your fabric choice. Such neat fabric for a bag. 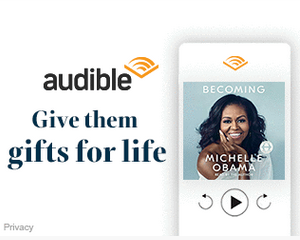 The accent strip gives way for buttons. I like that idea. Your bag is so cute Carole and you do such a professional job!